Kit contents provide two months of treatment (Steps 1, 2 and 3) plus over three months of Maintenance. 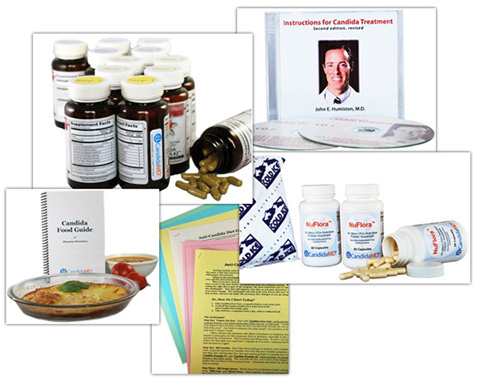 USB flash drive or 2-CD set: Instructions for Candida Treatment. Audio carefully walks you through the entire program. Candida Food Guide. The food and recipe guide that answers the question, "What do I eat on the program?" Written both for people who don't cook and those with experience in the kitchen. Step-by-step instructions from Step 1 through Maintenance, including guidance on how to prevent recurrence of Candida. Special medication instructions for those with diabetes, high blood pressure or high cholesterol. A scientifically prioritized list of foods to avoid that feed Candida, as well as a list of those foods you can eat. Liver and gallbladder flush instructions. A list of approved foods you can buy at Trader Joe's. ONLY SHIPS MONDAY-WEDNESDAY DUE TO REFRIGERATION REQUIREMENTS. COUNTRY TO WHICH THE PACKAGE IS SENT, AND ARE NOT CONTROLLED BY CANDIDAMD. DROP-DOWN LIST ON THE SHIPPING PAGE. © 2009 - 2015 CandidaMD. All rights reserved.